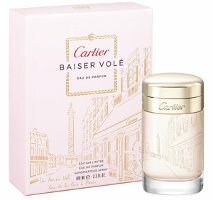 From Cartier, Baiser Volé in the Volé d'Amour edition: "Let the magic of an extraordinary lily transport you to the streets of Paris with Cartier d'Amour. The limited edition Baiser Volé, or stolen kiss, features an exquisite gold engraving of the Rue de la Paix." 100 ml Eau de Parfum, $145 at Nordstrom. From Annick Goutal, a limited edition of the classic Eau d'Hadrien: "Created by the Master glassmaker Waltersperger, this slender fluted bottle is a pleasure to see and touch. Around its neck sits a sequined white organza ribbon to accentuate its elegant posture." In Eau de Toilette or Eau de Parfum, at Annick Goutal. From Lalique, the Sheherazade (2008) edition of Lalique de Lalique — one of many older editions currently available at Neiman Marcus. $600. 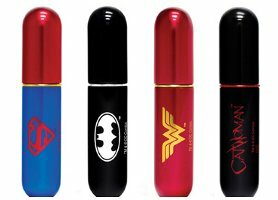 From Travalo, the brand's standard refillable travel atomizers decorated with the insignia of the Justice League's superheroes: Superman, Batman, Wonderwoman and Catwoman. £8 each at The Perfume Shop in the UK. Go to the NM site, and look under Fragrance, Collectibles…there are some really beautiful Lalique bottles — this isn’t even the best, just thought it might be one we’d never posted here before. I’ve seen images of a lot of them before – I like the Sillage one and the dragonfly – but this one is striking to me for its design/graphic presence. Thanks for running these LE posts, always fun to see! Is that the standard “female” Annick Goutal bottle with a ribbon of sequins? Looks the same. Since they mentioned the glassmaker, assumed it was “more better”, but I really don’t know. Oh heck, I wouldn’t be opposed to owning a ww atomiser:). seems like cartier has a lot of LE bottles for the BV, no? Was there another Cartier LE for Baiser? I’ve already forgotten! Thought they’d just done the 3 concentrations. I think that black dragonfly is the most beautiful! Love it. I think that one is my favorite too. Those Travalo atomisers are SO CUTE. I’ll take the atomisers. All of them. Thanks. call me crazy but I really don’t like the Lalique bottle, it’s creepy looking to me. You are not crazy, it is creepy. It looks like a blank face framed with black hair pulled back into a tassle ‘ponytail’.